Noticing a disembodied blue farmer’s cap floating over a table of old tools for sale was the cause of it all. Walking closer, I noticed the hat wasn’t defying gravity; it had been placed on a large bottle. Removing the cap, I found a most interesting, quite perfectly made bottle in all it’s simplicity. 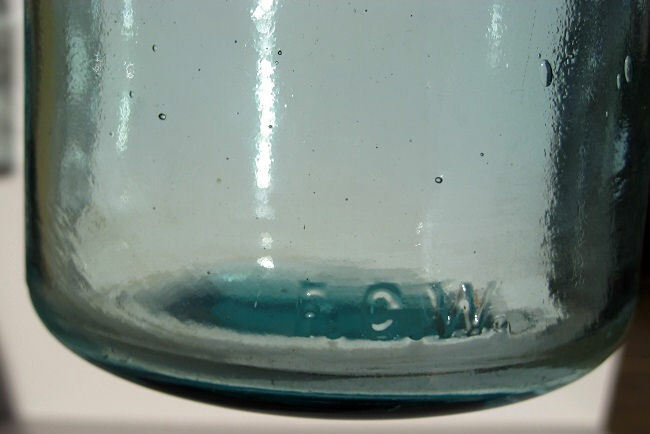 Standing 14-1/2″ tall, and 4-1/2″ diameter was a beautiful, very clean, mold blown aqua colored blob top bottle. It featured the most complete and amazingly well preserved wire bail and porcelain stopper I had ever seen. Price? $2.00. Sold. Into my hands immediately it went and homeward bound. Having noticed the fantastic preservation of the stopper, I was interested in the writing on the bottom of the large 1-1/2″ porcelain top. The rubber gasket was original and though a bit dry and ‘crackled,’ I was intrigued by the metal workings, which featured amazingly little or almost no rust or wear. 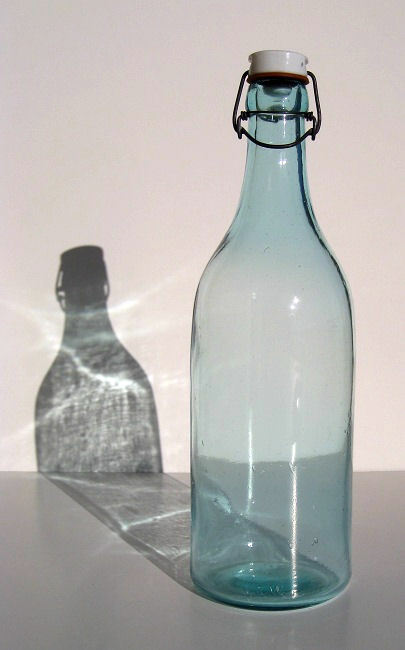 This bottle sat in an attic or similar place and had not been subject to dampness or extreme humidity. Every aspect of the bottle and stopper was literally in almost perfect condition. The bottom of the stopper read: PAT’D K. HUTTER FEB. 7 1893. 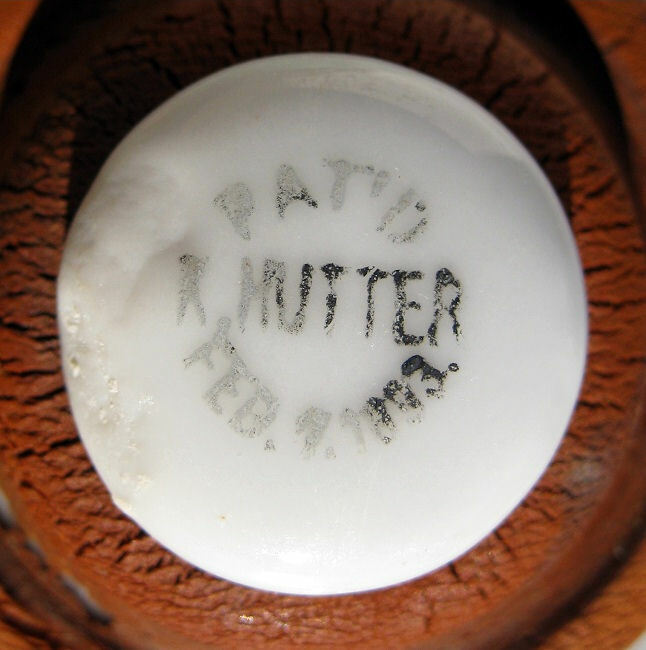 I was familiar with the Hutter name and was glad for the two dollars spent, as the stopper in it’s large size and excellent preservation was my deciding factor in buying it. 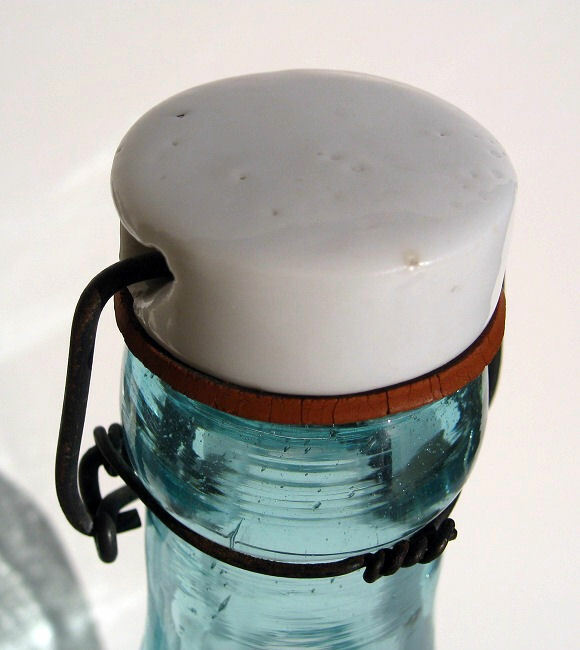 In most cases, especially with bottles of this type (usually in much smaller size) having been dug from the ground, the porcelain stopper is long gone and separated from the bottle due to the disintegration of the metal, leaving only the glass bottle to be discovered. Even when not dug from the ground, these stoppers are usually rather rusty. This was by far an exceptional example. This was a large beer bottle and the stopper is referred to as a ‘Hutter Type’ stopper. Many previous bottle closure types had been invented and worked for a time and had seen their issues, but so far, this was the best. (And is still in use to this day by Grolsch Beer, see below.) 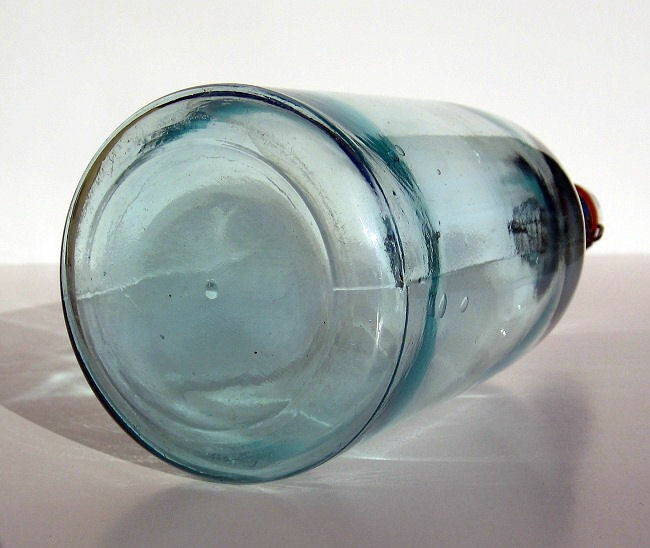 This was the final bail pressure type stopper used before the crown type as seen on glass soda bottles throughout the 20th Century and still used on glass beer bottles. 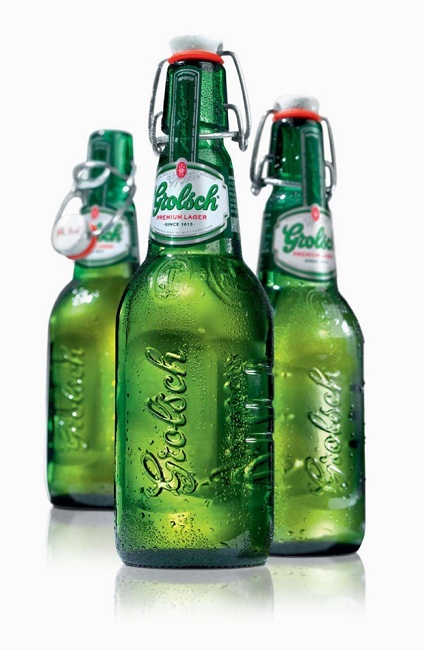 Modern day usage of the Hutter Stopper on Grolsch Beer bottles as on the 1oo+ year old example. The porcelain top is blank on this example, but many were made with the beer brand names and logos permanently glazed into the top in black, or in colors. 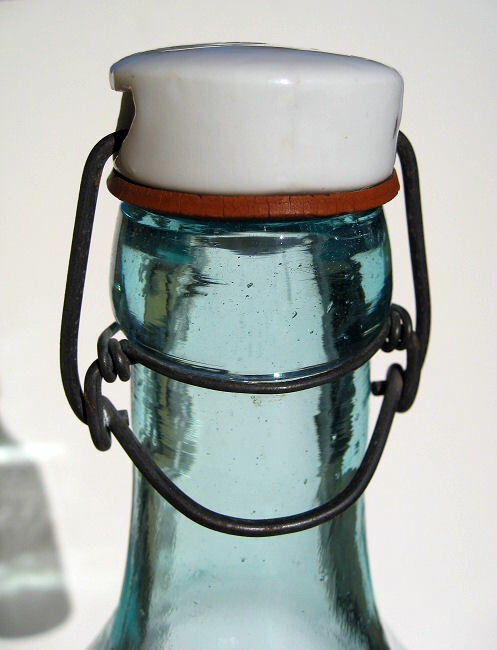 On the bottle itself, is embossed on the base edge the maker’s initials: F.G.W. Fairmount Glass Works of Fairmount, Indiana. 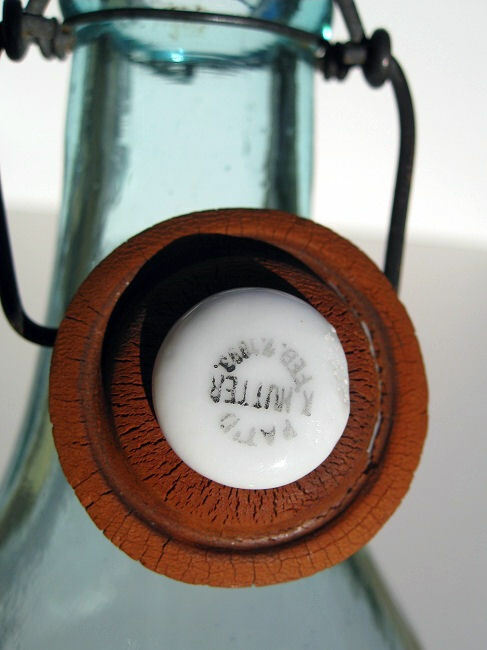 Their production of these bottles without any insignia on the commissioned Hutter stopper suggests that they marketed their bottles with this type stopper to many companies and the use of a paper label would indicate the company and contents, thus Fairmount Glass Works could mass produce these bottles complete with Hutter’s stoppers for any company in the market with such a need for one. 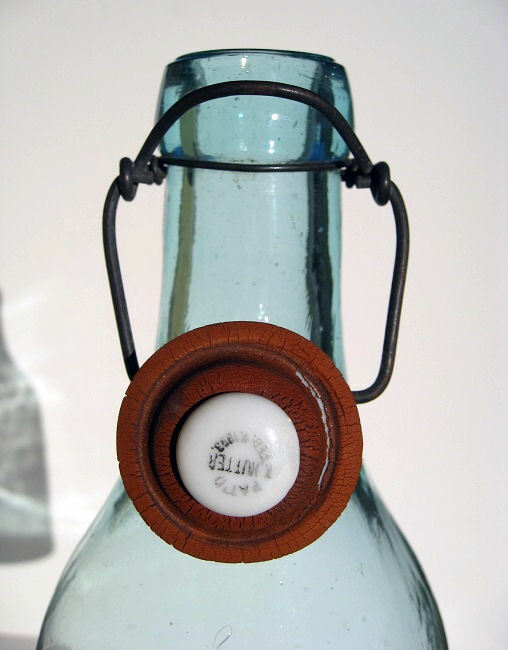 This particular bottle was made between 1898 and 1908 according to research into the Fairmount Glass Works history. 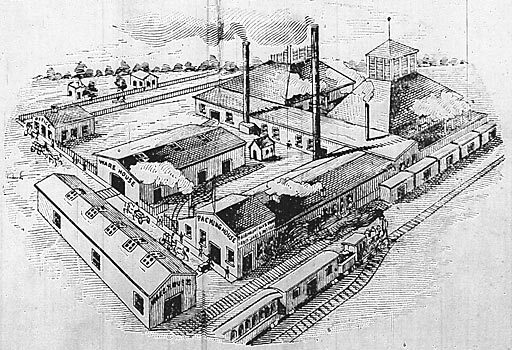 Undated illustration showing Fairmount Glass Works. 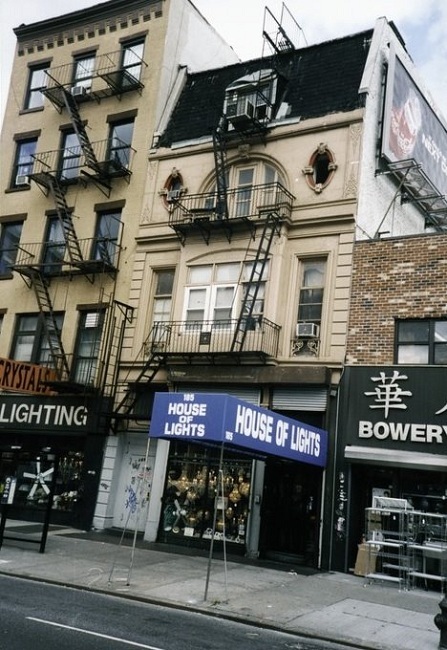 Karl Hutter’s business was located at 185 Bowery in New York City. He was known by those close to him to be a good person and kind businessman and did quite well for himself. His passion for collecting was oriental carpets which he kept in a double apartment overlooking Central Park where he lived until June 15, 1913. No. 185 Bowery, New York City in 2008. This building once housed Karl Hutter’s business. 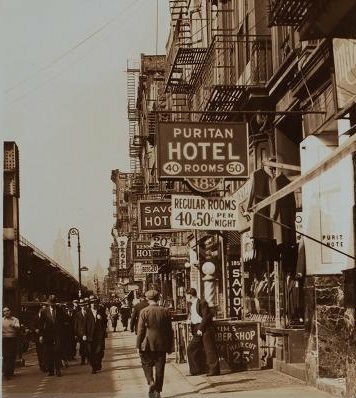 The Bowery in the 1930’s. The ‘Flop’ Savoy Hotel occupied the former Hutter business address at No. 185 Bowery. The demolition of No. 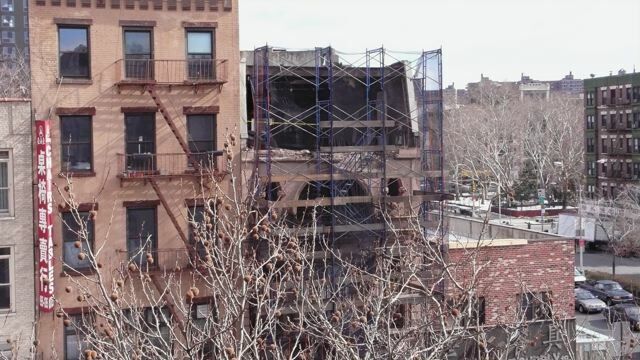 185 Bowery in 2010. Could anyone imagine what it must have been like sitting down and penning such a letter? How very unfortunate for a successful and well liked man to endure both his illness and the strength to commit the act to end it. For a mere two dollars I bought a hundred year old bottle, absolutely perfect in all it’s form and functionality. I guess I also got a little bit more for my money.